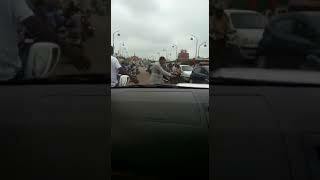 Actor Jackie Shroff has shared a video on Twitter where he is seen managing traffic on a road in Lucknow. In the video, the 61-year-old actor is seen on the road diverting vehicles coming from the opposite side on the same lane where his car is. The actor then goes back to his car after clearing his path.